"This software is a pleasure to work with. It multiplies creativity. It lubricates an idea and feels so intuitive. I've said 'wow' out loud a dozen times. I've wanted to get ideas out of my head for years and nothing has come close to giving me a platform to do that like liquid music." "With Liquid Music I never get stuck finding the right note and harmony variations for my songs. This is pure creativity!" Blank stares, cold sweats, and obsessive checking of social media—unmistakable symptoms of writer’s block. We’ve all been there. But with Liquid Music, producing new song ideas is fast and easy—even when you’re low on inspiration. Quickly sketch a melody shape or chords to jumpstart your creativity. Experiment with unique rhythms to find the right groove. You can explore new harmonies, melodies and beats in seconds, and see where your music takes you. Imagine your favorite melody—the swelling rises, plunging drops and every detail in between. 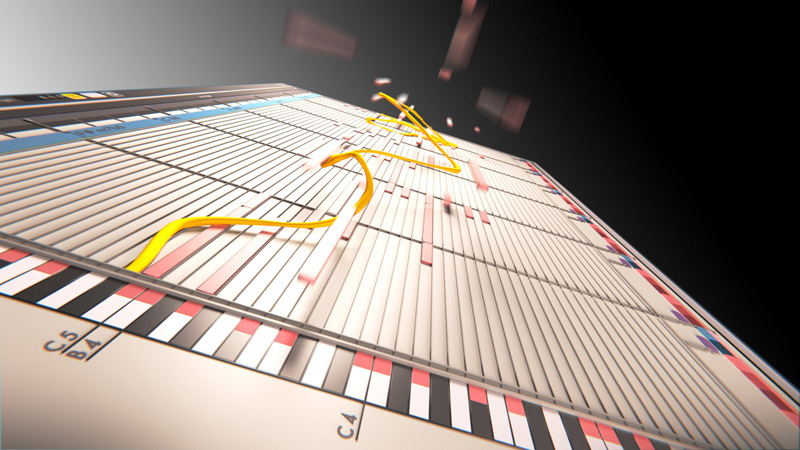 What if you could create that melody simply by sketching its shape? Well, now you can. 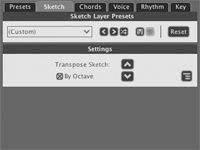 Simply draw a shape using the groundbreaking Sketch tool, and let Liquid Music develop the chords and melody around it. Inspire creativity. Accelerate creation. And complete those incomplete songs. All with Liquid Music. SEE THE BEATS. HEAR THE DIFFERENCE. Provide a heartbeat for your track by adding an intricate, interesting beat. 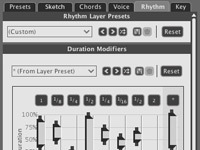 Liquid Music lets you make beats using note clusters and patterns instead of individual notes. Experiment with unique rhythmic patterns and dial in the perfect beat in seconds. It’s a revolutionary tool for maximizing your songwriting. You can adapt it to your evolving melody simply by using Liquid Music’s Harmony and Rhythm Modes simultaneously. Liquid Music includes a collection of presets that are guaranteed to inspire new song ideas. Use them to create original ideas and rich harmonies in seconds. 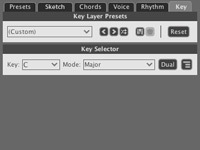 Or customize each preset by swapping different “layers” for nearly limitless possibilities. Each combination holds the promise of a new song…or a thousand. So start exploring and making new music in a new kind of way. Sometimes to build it up, you have to break it down. Liquid Music separates music into different parts or “layers” that you can tweak and customize to build the perfect track. 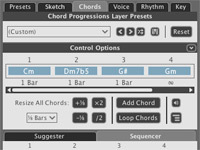 Each layer offers unique tools for morphing and evolving your music until it’s just right. Check out the different layers and tools below! Sketch is where all the layers come together into one intuitive musical shape. Simply click and drag to create original harmonies, spark new song ideas and draw the shape of your music. Want your music to build? Draw a cresting peak. How about a big EDM drop? Plunge your mouse down and draw a valley. And if you don’t like what you hear, just erase and start crafting your next idea in seconds. The key of your song impacts more than the notes—it determines what “mood” your track will have. Will it be an upbeat frolic through flower pastures with a major scale? A forlorn dirge in a minor key? Or maybe a trippy experimental journey of exotic tones with Ultralocrian or Phrygian b5 modes? Liquid Music has them all—and more. You can even transpose (move the notes up and down) to better suit your vocalist—no music theory degree required. Chords are an important part of every song. But with hundreds to choose from, how do you pick the right ones? Lucky for you, the Liquid Music Chords Layer provides two powerful tools for finding the perfect chords. The WaveDNA team journeyed deep into the land of known progressions and packaged them into the Chord Suggester—a tool that recommends complimentary chord changes and helps you build progressions. It’s an awesome tool…it better be…some of the team never made it out. Think of this tool like a drum sequencer—except for chords. It’s the easiest and fastest way to create clever chord progressions without hours of frustrating trial and error. Just pick a chord to start, and then choose complimentary chords from the recommended list. Or select chords at random—sometimes the chords you least expect can create the defining sound for your song. The more voices you use, the richer and more complicated the melodies and chords will be. Use the Voices Layer panel to add just the right amount of harmony. Even customize how thick the harmonies are at specific parts of the song and create cascading arpeggios. 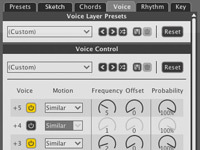 You can also import a melody into Liquid Music and use the Voices Layer to add harmony to it. It’s your music, your choice, and your voice. Rhythm. You either have it or you don’t, right? Not anymore. Liquid Music’s Rhythm Layer includes a host of tools based on our acclaimed Liquid Rhythm software—so you can experiment with new beats and add the right groove to your song. Customize your beats with tools for adjusting note duration, velocity, timing effects and more. You’ll be able to create unique, elaborate beats using note patterns and clusters—entire bars at a time. Browse the extensive list of rhythmic patterns to add rhythm in seconds. Crafting original song ideas with Liquid Music couldn’t be easier. Sketch shapes and explore unique melodies to get your creativity flowing and set a direction for your music. Dial in the perfect groove and beat with the rhythm features. Then polish your idea by taking control of the musical layers—change keys to evoke a different mood, add harmonies, alter the rhythm to humanize the performance, and more. How you want to create is up to you, Liquid Music just helps you do it a whole lot faster. Liquid Music comes with integrated tutorial videos and a comprehensive quick start guide, so you’ll be creating inspiring song ideas in no time. Liquid Music is based on years of research and development, and provides a unique workflow for creating intricate melodies and original song ideas, without requiring any theoretical understanding of music or instruments. Our proprietary technology structures raw MIDI data into musical components and layers that can be reorganized in new ways. The complex algorithms we’ve designed allow Liquid Music to guide, suggest, and generate new combinations that are highly musical and inspiring. If you’re using the 64-bit plugin version of Liquid Music, please make sure you’ve installed both 32 and 64-bit Java. For more information please visit our forum.